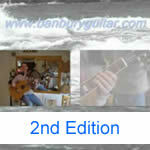 Learn how to play the guitar with this Guitar Tuition DVD. This DVD is an absolute beginners guide to playing guitar. Learn about the different types and styles of guitar that are available, learn some basic guitar techniques and exercises to help your guitar playing and learn some classic riffs to show your mates! • What type of guitar should I get? • Where do I buy my instrument new/second hand? • How do I tune the guitar? • How do I hold the guitar should I use a strap? • What are the basics on these instruments? • What is finger picking? • What is plectrum technique? • How do I read guitar tablature? • How do I play rhythm guitar and keep time? • Where can I get further free guitar info?